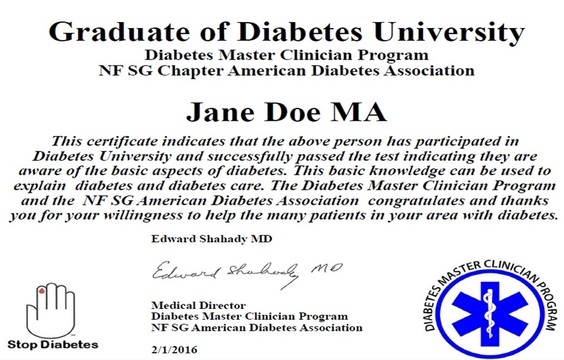 Diabetes University is creation of the Diabetes Master Clinician Program and the NF SG chapter of the American Diabetes Association. The program goal is to help staff in Primary Care Offices, ADA volunteers, patients and their families increase their knowledge and understanding about Diabetes. Knowledge plus understanding by all the team members increases the opportunity for patients to reach diabetes quality goals and decrease complications. This on line course takes about 1 hour to complete and after completion a certificate of participation will be issued if requested (image below). ​​Click here to start reading the slides It takes a few seconds for the slides to appear. After you read the material go to www.surveymonkey.com/s/DiabetesUniversityTest (copy and paste to your browser) This link will take you to the on line test. The test is set up for you to pass as it takes you to the correct answer if you give a wrong response. If you have a wrong response read the correct one and then hit previous and go back and correct your answer. Banner at top of this page has links to more pages to find more information that may be helpful for office staff as they care for patients with diabetes. Thanks for visiting the page, taking the test and and requesting a certificate. Together we can all Stop Diabetes.